In the last post, we discussed about the two qualities of thinking – focusing and expanding, and their role in creative thinking. These two qualities in fact represent two movements in the mind. These movements are like channels through which the thoughts are channeled. It is possible to make the mind experience this movement and hence train it. But it is not possible to do this when the logical mind is active and dominant. When the logical mind gets out of the way, the creative mind is exposed and it is then possible to experience this movement without the commentary. In some traditions of meditation they do this. One you are in deep meditative states (when the thoughts stop and the logical mind quiet) you can alternatively become aware of something very big (like a mountain) and something very small (like a grain of sand). If your meditation is deep enough, you can feel both the expansion and focusing of the mind. Note the term ‘aware’- in meditation we only become aware. It is the logical mind that thinks and the creative mind is just aware. When the creative mind experiences this movement, it learns. See the brilliance of the people who designed this. When you pray to the lord, that is a moment where thoughts stop – which means the logic stops. 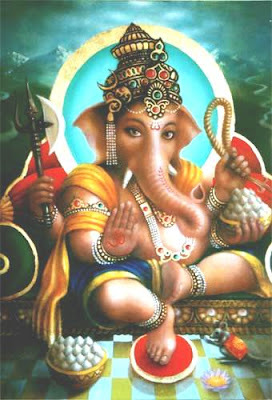 Now the gross form of Ganesha gives you that expansion in the mind and the rat creates the movement of focus. And this is what you need when you begin any new activity – ability to think big and ability to pay attention to details. It is in fact a great idea to use visuals (like statues or photos) to create these movements in the mind, because visuals are perceived by the creative mind. This entry was posted in Uncategorized and tagged Awareness, Brain, conciousness, Creative thinking, Creativity, expansion of mind, Ganesha symbolism, Hindu religions, Hindu Spirituality, How we think, Logical mind, Lord Ganesha, Mind, Mindfulness, Nature of Mind, Patterns, Perceptions, presence, Present Moment, Right Brain, Symbols, Thinking, visual thinking on March 17, 2010 by Sajeev.